Lithium manganese silicate (Li2MnSiO4) demonstrates rich polymorphism with orthorhombic Pmn21 polymorph having better crystalline ordering over orthorhombic Pmnb and monoclinic forms. In this work, Li2MnSiO4 nanoparticles with the Pmn21 phase were synthesized by hydrothermal synthesis. Powder X-ray diffraction, HRSEM, and HRTEM as well as SAXS investigations revealed crystalline, spherical nanoparticles with average diameters between 14 and 25 nm. The binding energy of surface active Mn2+ ions in Li2MnSiO4 was observed at 642.9 eV in XPS analysis. SSNMR spectroscopic results revealed isotropic peaks at − 288.5 and 295.32 ppm which are attributed to the hyperfine coupling between the Li nuclei and the unpaired electrons of the Mn2+ ions. 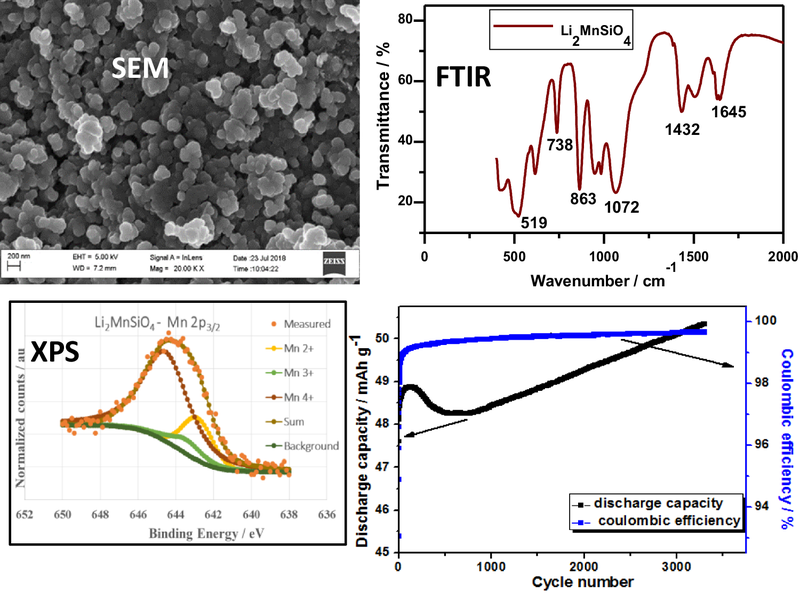 The electrochemical properties of Li2MnSiO4 electrode were studied in various 1 M LiX (X = SO42−, NO3− and ClO4−) aqueous electrolytes at a potential window of 0.2–1 V. Studies in the Li2SO4 aqueous electrolyte demonstrated better electrochemical properties with increasing peak current values up till the 2000th cycle. Charge and discharge capacities of 77.0 and 57.7 mAh g−1 were obtained at a scan rate of 5 mV s−1 with a Li-ion diffusion coefficient of 1.61 × 10−16 cm2 s−2. 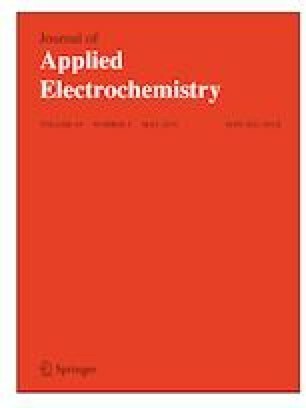 A small charge transfer resistance in the Li2SO4 electrolyte was also observed in EIS measurements indicating faster charge transfer kinetics. An aqueous Li-ion Swagelok-type full cell was assembled with microcrystalline graphite as anode and Li2MnSiO4 as the cathode. 1 M Li2SO4 was used as the electrolyte. 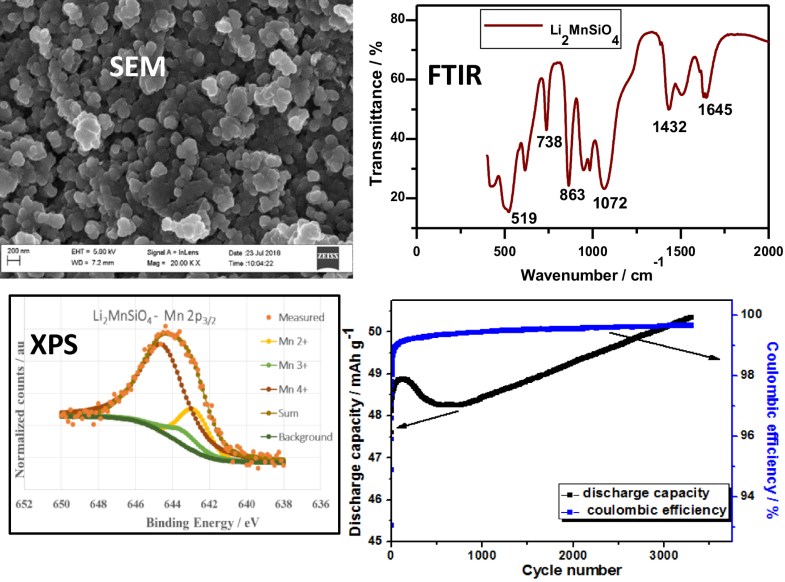 The cell delivered a charge capacity of 61.8 mAh g−1 and a discharge capacity of 52.5 mAh g−1 at a current load of 1.2 A g−1 with good capacity retention of 94.0% and a Coulombic efficiency of 99.5% over 3300 cycles. This research work was financially supported by the University of the Western Cape and the National Research Foundation (NRF) of South Africa.